Thank you so much for inviting me to write about my journey with ChoreoBarre®Fitness! As you know, ChoreoBarre®Fitness is so much more to me than just an exercise program. When I was 25 I was diagnosed with an advanced, aggressive form of breast cancer. While undergoing treatment I found out I have one of the breast cancer genes, so I knew I had to take good care to try and ensure that I would not have cancer again. I stayed thin (they used to recommend this, turns out it is not so important – but still glad I did! ), ate a healthy organic diet, and regularly got screening tests. I met my husband, got married, gave birth to two amazing daughters, and practiced law working on behalf of people who need an advocate – for the last five years that has been survivors of domestic violence and their children. For 17 years I stayed cancer free, the only side effect seemed to be osteopenia as a result of the treatment and having the complete hysterectomy after my kids as another way to prevent future cancers. Unfortunately, an MRI in December 2014 found a small new breast cancer. I underwent surgery and radiation to treat the cancer. I also agreed to low-dose chemotherapy and hormone treatment as a precaution against a recurrence. When I asked my oncologist what else I could do to prevent cancer, she said the best recommendation would be to exercise “regularly, not occasionally, not sporadically, but regularly.” So that was it – I hate exercise, but exercise would have to become a REGULAR part of my life. Our gym has a fantastic cancer survivorship program, and I got help figuring out what would work for me. My trainer recommended trying ChoreoBarre®Fitness, she said she’d never seen people sweat so hard while looking like they were doing nothing! I am so glad she turned me onto ChoreoBarre®Fitness! It’s been about two and half years since I started, and I feel strong and flexible, and I am so proud of my progress! I never thought I would be one of those “gym people” but I never want to miss a class! I now exercise 5 days a week, and I love ChoreoBarre®Fitness! As a bonus, my bone density tests even show a 3% increase in my bone mass! And I have not even mentioned how wonderful it is to smile and share with all the amazing women in our classes – we have a tremendously supportive community of all ages, shapes, and backgrounds who really support each other! My oldest daughter couldn’t wait to start coming to ChoreoBarre®Fitness when she turned 10, and my little one is counting the days until she can come, too. I am so glad I get to be a role model for them about making time to take care of yourself, and finding an amazing community like ChoreoBarre®Fitness to put your energy to work! Thank you Anna, and all my ChoreoBarre®Fitness sisters for supporting me through this journey! Hurricane Harvey was bearing down on Houston. My parents, two brothers, and their families, and countless friends stood in the path of destruction. This wasn’t the first time. Houstonians are used to this as hurricanes collide every few years with the 4th largest city in the nation. But this one panicked even longtime residents. Mother nature and her powerful agent, water, fell and kept falling for days. It filled the streets, creating rivers between neighbors. Water levels grew to doorways and then seeped in, uninvited. Many friends were told to evacuate but by then it had to be by boat. My parents have lived through many floods but not once in 25 years did water make it into the house. This time was different for this city of bayous. Harvey had his way. My mother woke up in the middle of the night and as she stepped down onto the floor, she felt the strange, spongy sensation of wet carpet underneath her feet. The frantic scramble to then get all items of value “up” ensued, starting with the safe (in the floor) and then her geneology research. Living in a one story is good if you’d like to avoid stairs but not good if you have water flowing into your house, inching up the baseboards, up the sofa and table legs. Together, my parents perched where they could – their bed, until dawn when they could assess the water level and the damage. The dark seemed darker that night, and sleep was impossible. Throughout the city, scenarios such as this played out among the 6 million inhabitants. Friends were taken by boat from their homes, some losing their pets in the frantic moments of escape. Photos and news clips horrified. The weather radar ominously showed a red mass covering the entire SE corner of this immense state. In California where I now reside, I obsessively checked Facebook for posts with personal news from home. A former student who is now a teacher, shared that her high school flooded and would be closed for a year. Her daughter would spend her Senior year in a temporary building. So many, many people were affected this time, by this storm. But the worst part for me, was my dad’s voice. The strong, positive, can-do attitude replaced by exhaustion and something I never remember hearing from him – fear. I helplessly anguished over stories friends posted, but rejoiced at their safety. Admiringly, I read the positive, uplifting comments from many whose homes were ruined, wet, growing mold. They had their lives, they had each other. Material things become less important when faced with a dark, wet night full of winds and terrors. Both brothers were lucky as the water stayed outside and eventually drained away, but my parents home is uninhabitable. They have stayed with friends and my two brothers for weeks and will soon visit me in California. As we all piece together a new life with them, I do what many Texans are also doing: Look for the silver lining. Texans are strong, good people who will pull on their boots and together rebuild their homes, schools, cities, and lives. Our family will help my parents (and thankfully, we CAN help) find a home closer to my brothers; modern, new and convenient. This silver lining is the result of that wet, dark and windy night. But many people need help. It is through thoughtful and caring people like Anna Gemma, creating a way to give back, that Texas will rebuild. 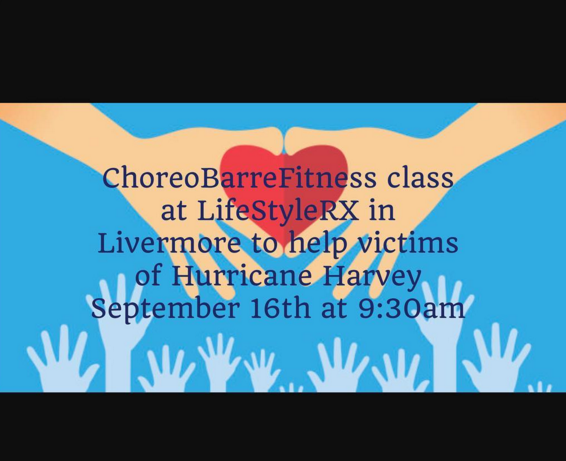 I thank her for hosting her ChoreoBarre®Fitness fundraiser, those who participated, and the donations to the people affected by Hurricane Harvey. This 1000-year storm will not be forgotten, but neither will the caring people who have helped to rescue, recover, and rebuild for the millions in Texas still suffering. One of the worst encounters in life is immobility. I know this because I experienced it through knee pain so excruciating and muscle tightness so rigorous, I was unable to walk. Sleep was impossible as a comfortable position was difficult to find. I dreaded the act of getting out of bed partly due to the pain and partly due to dreading how bad it would be. Which is worse, the pain or the uncertainty? How will I recover from this, I wondered. Will it require surgery? Is this arthritis? Will I limp or be immobile for the rest of my life? Have I entered old age?! As a dancer, I always enjoyed confidence in my body’s abilities whether performing, teaching or just going to the gym. Walking into the gym feeling great - I knew I could do what I set out to do each workout. Being passionate about fitness, I rarely skipped a day. But then, beset with this mysterious injury, I found myself unable to walk up the stairs to the 2nd floor gym, let alone cycle, lift weights or do any form of cardio. I believe my small knee tightness was caused by driving. Lots of driving over the summer. The pain increased. Unsure what to do and lacking in time to care for myself, I let it go and continued on the same path until the pain was too much and I couldn’t move. A friend recommended a sports chiropractor who told me he could have me back in action in five appointments. Feeling cautiously optimistic, I followed his advice which was to perform a spinal rotation stretch on only one side for a week. When I saw him next I was limping and still unstable. Over the course of the remaining appointments, his positivity motivated me. I was sure I could go to the gym and do something. I took the stairs to the gym one at a time. I was sure everyone was watching me. What is wrong with her? She looks fine. I felt old. I wasn’t ready. Nothing was easy. I lost strength. I lost confidence. I lost a huge part of my identity. I realized that a change in routine was the only way. I threw out my old workout regimens. I researched knee strengthening exercises and obsessively stretched as the chiropractor prescribed. I spent lots of time on my bedroom floor, utilizing foam rollers, balls, and bands. Online I read about something called Yin Yoga. I am not a yoga person, I stupidly said inside. Yoga mat tucked under my arm, I took the stairs to the gym again one at a time and tried Yin Yoga. While others grimaced and moaned, I floated on my mat, blissfully holding advanced stretches for up to 7 minutes. I had found my zen. Hooked on this fascia-focused practice, I felt tightness release with each session. Some of my former flexibility returned. A glimmer of my former positive self stirred deep inside. But, the time off left me with one other obstacle - Weakness inhabited my once strong legs. The visible lack of muscle tone reflected in the mirror reminded me that I was still afflicted. Feeling dubious, but at least able to walk up stairs normally, I went to the weight room for a scientific measurement. I sat at the leg extension machine and and moved the pin to the lowest plate - Barely anything! Even as I grimaced the weight bar would only move an inch or two. My research on knee strengthening was put to use at home, but it wasn’t enough. I missed the gym. I missed my old self. What else could I add to my gym routine? I remembered my old barre exercises. Great for flexibility! Great for balance! Great for leg strength! Comforted by the surety of holding onto the barre, I again climbed the stairs to the gym with my nerves on high alert. Before barre class began, the thought of trusting my left leg, caused me to break into a sweat. Grande plie was out of the question. Shaking in barre is expected, but this was a different level. It would take awhile to trust in that leg. I made it through that first barre class. I could do much of the class without a problem which felt invigorating. The instructor offered affirmations including one to be thankful that each student had the health to come to the gym and take that class. Those words resonated in my head a million times since then. While continuing to take Yin and adding more barre classes, I heard about a class taught by a former Russian ballerina. My heart fluttered. How I would love to try this! I wasn’t sure I was ready…My pain had lessened, but strength and stability was still in question. My curiosity got the best of me. I walked into the class without a limp, determined. I took my place at the barre. I listened to the Russian accent, I closed my eyes and breathed into the movements the way I was taught. My technique was rusty and I felt awkward, but my knee and heart were in the right place. My instructor encouraged me immediately by gently correcting my placement and asking me to come back for the next class. I thank Anna Gemma, for from that very first class with her, she pushed me even further than I ever expected. They say you can come back “better than ever”. I agonized, questioning my ability to heal or ever even walk normally again. I remember how far gone I was physically and the dark days on my bedroom floor. I know how hard I worked to get back to my former fit self. Less than one year ago, I was unable to walk, but today I am working towards becoming a ChoreoBarre®Fitness instructor. Excitement about this new, unexpected direction is definitely making me feel “better than ever”! I certainly could not have predicted this new path, but it is one that I can walk empathetically with others. Back health is of supreme importance. Maintain strength. Continue to stretch. Take healing yoga. Enjoy massages and adjustments if you can. Take care of yourself, listen to your body, and when set backs occur, know that with time and proper care, former levels of health and well-being can return! ChoreoBarre®Fitness made its way to Las Vegas for the 4 day, IDEA World’s 35th Anniversary Fitness Convention where over 10,000 health, fitness, and wellness professionals attend to educate, promote, and inspire others about up-and-coming fitness regimes and training programs on the rise. CEO and Founder, Anna Gemma, was interviewed about the foundation and format of ChoreoBarre®Fitness and also shared some of her best tips to clients and new members about staying fit. Check out this must-see, 3-minute interview!